It’s a new label it’s a new dawn. Colin Bain, the artist behind Device Control, hails from Glasgow and launches the self-titled imprint with a sharp-cut EP. 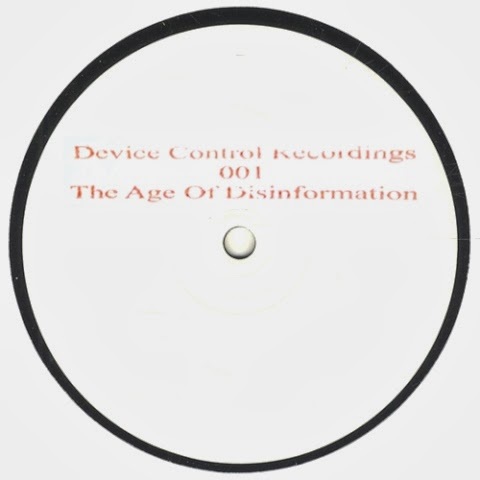 At closer listening “The Age Of Disinformation” sporadically sounds like a tribute to Neil Landstrumm’s similarly titled “Understanding Disinformation” from 1996, if only to think about “The Glasvegas Experience”. The opener is a standout techno track: “Business Separation” reflects volcanic emotions of proxy fights in a melting pot of raw bass and crushing loops. Punchy drums of the original “You And Others” make a bold reference to The Infiltrator’s “The Extraction” while Galaxian, electro-obsessed fellow Glaswegian, acts as noise bringer and conducts extra demolition job. The Plant Worker aka Damian Lapena from France uses bleeps and hiss for slight droning effect but maintains the gritty essence of the EP. Total device control, guaranteed.